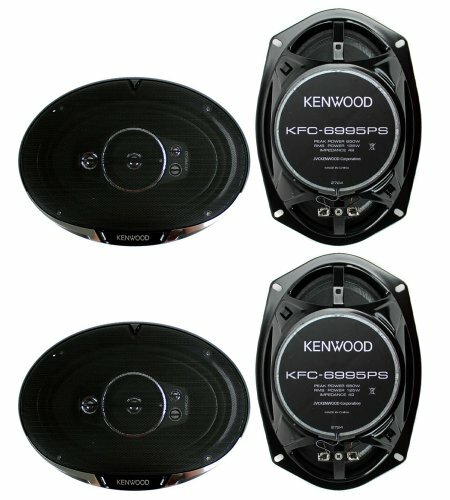 The Kenwood KFC-6995PS 6x9" 5-way car coaxial speakers can handle 650 watts (1300W per 4-pack) of MAX power per pair and 125 watts (250W per 4-pack) of RMS power per pair. They feature a 1/2" PET balanced dome tweeter with a 1/2" super PET dome tweeter and a 3/8" ceramic tweeter. Also, the steel black basket reduces noise cancellation to help you achieve superior sound. The Kenwood KFC-6995PS makes for a great option when upgrading from your factory speakers! - 650W MAX power (1300W per 4-pack) - Grilles Included - 1/2" PET Balanced Dome Tweeter 1 buy = 4 speakers 1 Year VMInnovations Warranty!